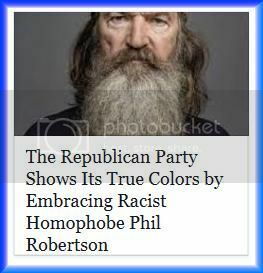 The other day while walking in a parking lot heading for a grocery chain, I saw in big bold letters on the back window of a pick-up truck these words: PHIL ROBERTSON FOR PRESIDENT. Not only does this crazy old coot have a religious following, he also has (apparently) convinced some of his admirers that he should politically lead our country. That's one big barrel full of Bat Sh*t NUTS!